In one of the parts catalogs, All Electronics, were some LED strips, both cool-white, #LS-123CW $3.25 each, or warm-white, #LS-123WW $30 for ten strips. These were either in plastic cases or bare strips. The ones in plastic cases were more expensive; $3.25/each, $3.00 each for 10 or more. The ones just in a ribbon strip cost $2.35/each or $1.75 each, for 10 or more. With such inexpensive LEDs I wanted to see what could be done to improve/replace lighting and reduce the cost of using electricity throughout the house. What follows are just a few of the projects I've done with these LED strips. Some not shown are lights for the basement, walk lights outside, and replacing some of the outdoor lights with ones I built from these LED strips in a similar way as was done building the piano light, except the strips were wound around a plastic pill bottle for 360 degree illumination. 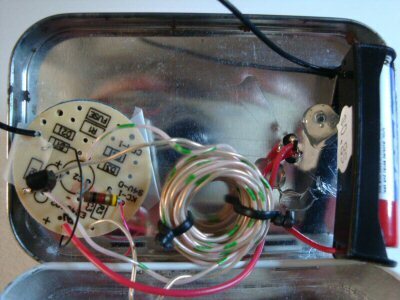 A pill bottle with a wide enough opening was used so the 12V 500mA power supply circuit board could be slipped inside the bottle. I have also made what I call my Traveler's Night Light which simply uses a diode, LED, AC Capacitor, & sometimes a resistor all inside a non-polarized AC replacement plug one can get from a hardware store. In the trunk of my car was a pathetic 12V bulb that was almost useless for lighting up the trunk even on a dark, moonless night. I replaced it with two of the cool-white modular strips and now have enough light to see where things are in the trunk. I figured that two of these strips of three warm-white LEDs should be able to replace the long 40W incandescent light bulb. The question was how to power them. They needed 12V and each three-LED strip used about 40mA, so the two strips would need at least 80mA. In the same ALL Electronics parts catalog, I found a 12V 500mA switching power supply, #PS-1251, for $8.50. The nice thing about switching supplies is that they tend to use only enough electricity to get the job done. In other words, since these two LED strips needed 80mA at 12V (which is 0.96W) I could expect the power suppy to use about one Watt of power, not the full 12V at 500mA or six Watts. As it turned out the LED "bulb" did use only one Watt when I measured it using a Kill-O-Watt meter. LED Tester, no core used! I used the base of a dead LED light bulb I had cut apart to salvage parts from. The circuit card was then cleared of all parts and used as the card to hold a new Joule Thief circuit used in an LED Tester I built. The LEDs from the dead LED bulb seem to be fine and I have hopes of getting them into a new bulb of my own design. Our piano Lamp uses a long 40W incandescent light bulb. Figuring that these light bulbs would eventually be discontinued I set about figuring out a way to replace the bulb with an LED version. The circuit card from a 12V 500mA switching power supply was removed and attached to the light bulb base. Longer wires were added so it could attach to the two LED strips which were going to attach to the outside of the PVC pipe section used. After the PVC pipe section was slipped over everything and screwed to the light bulb base, the two LED strips were screwed onto the 6.5" section of PVC pipe. The pipe dimensions were: OD: ~1.66" ID: ~1.37". The OD of the LED bulb base is about 1.455" so some of the inner PVC pipe had to be removed so that it could fit over the base of the bulb. Last, the new bulb was put into the piano lamp and turned on. The proof of the pudding was that my wife was able to use it in the evening when she was working on a new piece of music and didn't complain: no news is good news in this case. Assuming the power supply lasts as long as the expected life of the LEDs, which is 50000 hours, and based on using the bulb five hours/day, the new bulb will last about 27 years. The savings, based on $0.10 per KWhr, will be 39 Watts for five hours while it is in operation, times 365 days/yr, or about 71 KWhrs every year, or about $7 a year. and don't forget the Joule Thief test/experiments page that started all thess LED replacement lighting projects.